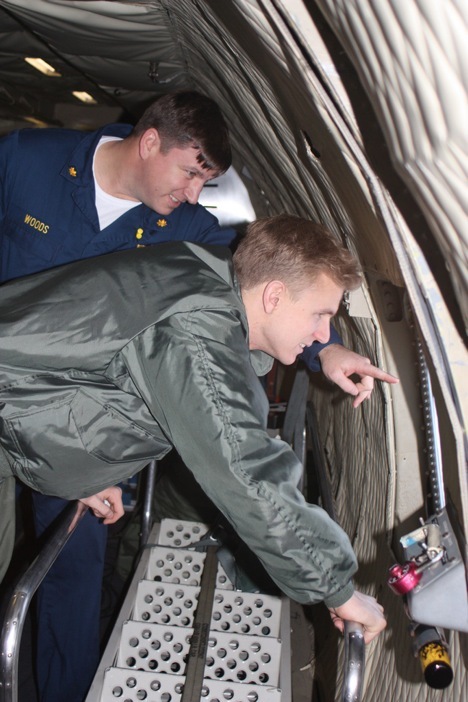 With three sea ice flights successfully behind us, and the airport being closed on the weekend, we had a day off from operations, and took advantage of the great activities that are coordinated by the Community Center here at Thule AFB. Today’s trip was a hike to the Ice Cap. About two dozen folks (mixture of Air Force Personnel, Danish Workers, and NASA IceBridge Team Members) piled into 4×4 trucks, and headed off base about 20 minutes drive. The last 5 minutes of the drive was “off-road” and we went as far as we could until 2 trucks got stuck in the snow. After a few minutes of shoveling and getting everyone back on sturdy ground, we took off for the 45 minute hike to the ice cap. It was a pleasant walk, over mostly hard ground, with some areas of soft snow making for a good work out. We took several short breaks to stop and listen. The silence was incredible. There was no breeze, and absolutely no noise. No cars, no power poles, no animals (that we could see at least), just absolute silence. It was a very cool experience. 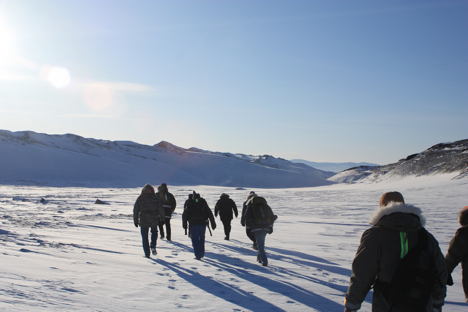 We arrived at the area where the ice cap is exposed, and took some photos. 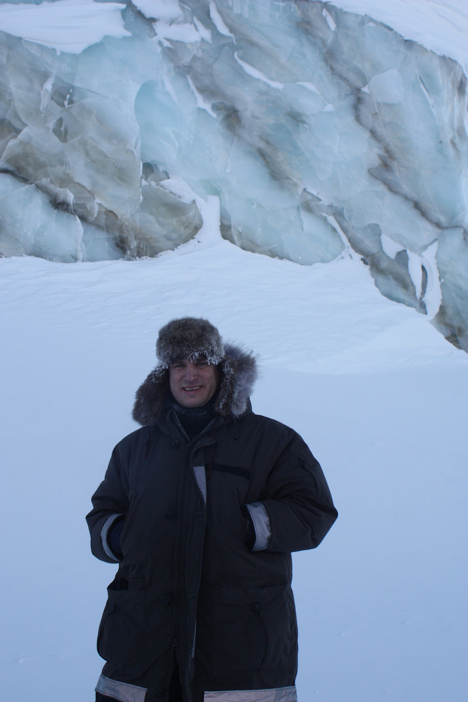 The exposed blue, white, and brown banded ice was another breathtaking sight that I had never experienced before. After another few hundred yards down the trail, we arrived at the sledding hill with another amazing vantage point after climbing to the top. On the walk back, I found some fox tracks in the untouched snow that made for a great photo. There was no sign of the fox around, just for its left over paw prints in the fresh snow. We finished the walk with some Hot Chocolate and cookies, warming up and swapping stories about each person’s favorite part of the hike. Today we flew again and went right by the North Pole! The NASA P-3 went 2 degrees to the left of it, if you picture looking straight down on top of earth! The flights are usually about 7-8 hour missions so I woke up early and went to breakfast. After we got on our track over the sea ice, it was difficult to get good measurements because the clouds were so thick (the Lasers need clear skies). So the plane went to 1000 feet, which is very low. This made it exciting to look out the windows and see the sea ice below passing by really quickly. After we descended though, the laser altimeters began working better and collecting good data. 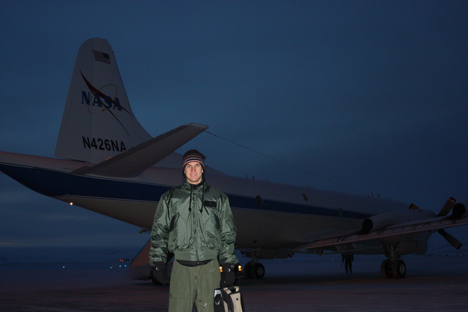 We landed around 1530 and I headed back to the North Star Inn to meet with a NOAA scientist Larry Connor. Dr. Connor wrote a paper looking at laser and radar altimetry measurements, so it was great getting to ask him questions about his work. In just a twenty-minute conversation with him, he was able to answer all the questions that were forming in my head from hours of reading and studying his paper. Tonight is my last night here so I went to the Top of the World club to say my goodbyes to all the engineers and scientists I got to meet during my trip to Thule AFB, Greenland. I learned so much in my short week here; all the equipment onboard is so complex and it measuring features of the Arctic in order for scientist to study the change this environment is undergoing. It was reassuring knowing that there are so many intelligent and hard working people looking at the poles and trying to understand the dynamics of them. I am excited to continue studying polar oceanography and hope to continually learn more as I pursue a higher education in graduate school. Another early morning wake up, with a quick check of the weather. I went to bed last night with snow falling, and not so promising satellite pictures showing a fairly significant storm system off to our west. I was thinking that we would be cancelled due to weather, but woke up to surprisingly calm conditions. The system skirted by us to our west and headed due south rather than east. The weather conditions here in the Arctic are much different from home, and I am still trying to figure out how the weather systems move about the area. I created a picture from this morning’s satellite image, with approximate locations of Thule, and our proposed flight path. 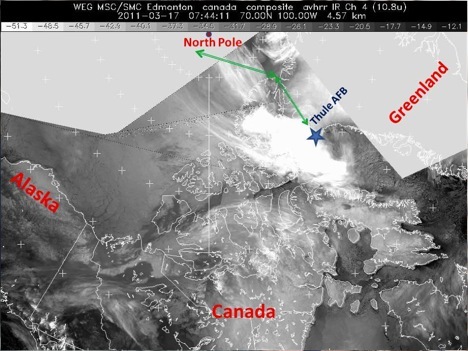 You can see the major part of the weather was to our west, and we had some high clouds in our operating area to the north towards the pole. Today’s mission was another satellite underpass track, this time for the European Space Agency CRYOSAT platform. Take off was under relatively clear skies, and we got some great views of the surrounding mountains and glaciers around Thule. 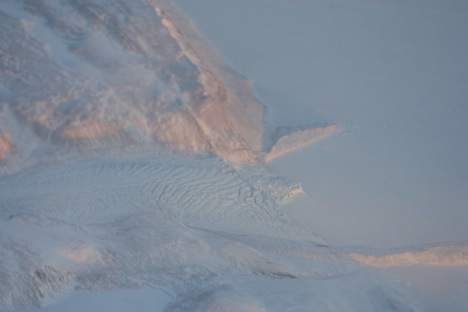 I am told that this was nothing compared to the upcoming land ice flights, but I was still in awe with the beauty of the ice flowing towards the sea, and the morning sunrise reflecting off the snow covered mountains. The calving front was clearly visible from our low altitude just after take-off. This is the area were the land ice meets the water, and at this time of year the water is still froze, so the sea ice sort of acts like a buffer to hold up the glacier. During the summer months, the sea ice retreats due to the warmer air temperatures, and the glacier flows freely into the water, and calves into icebergs. About an hour and half into our flight, we reached the beginning of the data collection line. We dropped down to 1500 feet in attempt to get under the clouds to allow the instruments on board to collect data. Today, the cloud deck was down around 1,000 feet, so we had to fly below that level. 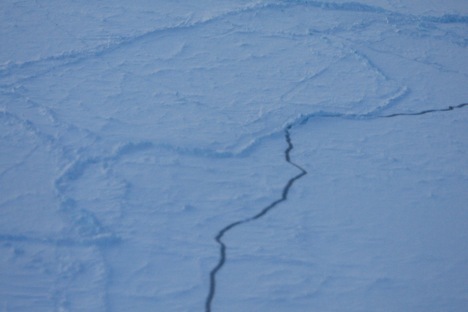 This made for some spectacular viewing of the sea ice conditions. After about 2 hours of flying our survey line, we had reached approximately 87.5 degrees north, only 150 miles from the North Pole. The P-3 made a wide S turn to back track on the same line that we covered on the way out. This gives the instrument teams, twice the data to be compared to the satellite that would be passing over our heads, taking similar measurements. Another 2 hours of data collection on the way back, and now we have just broken off the survey line and are heading back to base. Happy St. Patrick’s Day everyone! I have yet to see a single sign on base advertising any sort of celebration, so we might just have to create our own. Midshipman Brugler departs tomorrow morning on the rotator flight back to BWI airport, so we will go out in search of some congratulatory Corned Beef in honor of his departure. I will be staying on here in Thule for at least one more week, hoping to get on the flight across the Arctic to Fairbanks, Alaska to survey the Navy Ice Camp. Weather permitting of course! Today was the day I had been waiting for all week. 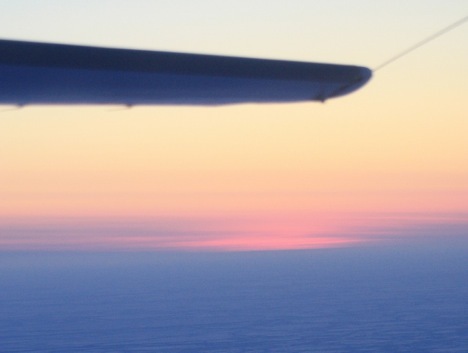 It was the first flight day of the IceBridge operation out of Thule, Greenland. Flying today had a special meaning to me for a few different reasons. I recently was selected to become a Navy pilot, which is a goal I have been working towards for some time. Therefore, upon completion of graduate school, I will report to Pensacola Florida and begin flight training. I was able to talk to the pilots, flight engineers and air crewmen of the NASA P-3B who happen mostly ex-Navy guys which was a pretty cool experience for me. 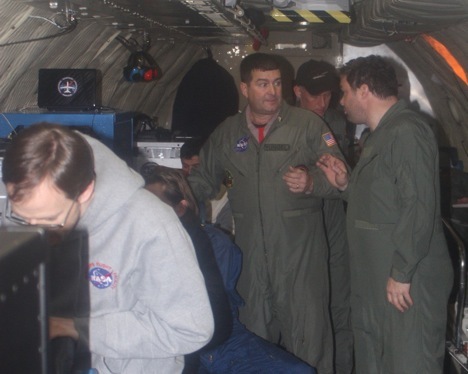 So not only was I constantly interacting with the scientists and engineers, but with the people actually flying the aircraft and allowing the mission to happen in the first place. The day started early because we had to report to the aircraft by 0700, so I woke up got breakfast and headed right over to the hanger. The actual flight, although a long mission, was nothing short of amazing. We flew a path known as “Connor Corridor,” a flight taking us from Thule to north of the Canadian Archipelago. This was a “ENVISAT” mission meaning we would be flying over the sea ice and actually going over a region that an ESA ENVISAT satellite would look at later in the day. This was really interesting for me since I am studying the sea ice variation in the Arctic; therefore it was cool getting to see firsthand what I am reading about in books and learning about in my classes. Not only did I get to see some amazing scenery, I also learned a lot from the people taking measurements onboard. On the P-3B, there is a gravimeter, a few airborne topographic mappers (ATMs), some cameras for the digital mapping system (DMS), ku-band radar, snow radars, MCoRDS radars and a magnetometer. All of this equipment is collecting data and in fact a lot of the instruments’ measurements are used together with other equipment in order to give the most accurate depiction of the Arctic as possible. We landed around 1600, making it about an 8-hour mission! Although it was long, it was an experience I will remember for a lifetime; I am excited to fly again tomorrow, hopefully the weather will hold out and let us get in the air once again. My alarm clock was set for 5:30 this morning to wake up, shower, get some breakfast and be at the hanger no later than 7 a.m. for an 8 a.m. take off. The weather was good for our target area north of the Canadian archipelago (islands), to survey the sea ice beneath the ENVISAT (LINK) satellite overpass that would take place later on in the afternoon. Part of the goal of IceBridge is to compare measurements taken on the P-3 to those measured by the satellites orbiting overhead. Since the satellite has much better spatial coverage then our airplane, if we can get good agreement between its data and the P-3 data, then we can trust that the satellite data is good. This will be tested on another level later in the week (hopefully) when we fly over the Navy Ice Camp, north of Alaska, where they will have instruments on the ground that we will then compare both our plane and satellite data again. What type of instruments do we have on the NASA P-3? A Laser altimeter called ATM (Airborne Topographic Mapper), measures the distance between the plane and the sea ice surface, which gives us an elevation measurement. There are multiple radars, including one that measures snow thickness on the surface of the ice. A gravimeter is measuring Earth’s gravitational field, which in turn tells us about the bathymetry, or sea floor below. A magnetometer is measuring changes in the Earth’s magnetic field, again to give us an idea as to what the sea floor below looks like. We also have three digital cameras pointed downward below the plane taking constant pictures of our flight path. It took about 90 minutes to get to our first collection waypoint. Weather plays an important role for the data collection because clear skies are needed for the instruments to take proper measurements. This morning’s weather briefing looked like our collection area was going to be relatively cloud free. After the transit, we dropped down to 1,500 feet and switched all the instruments into collect mode. The weather was perfect, and viewing the sea ice out the window was breathtaking. Lots of people think of the Arctic as just a flat expanse of white. This couldn’t be further from the truth. There are all sorts of cracks (leads) and mountains (ridges), similar to tectonic plates. The ice below is constantly moving via the winds and currents, and those forces acting on each piece of ice makes for a very dramatic seascape. 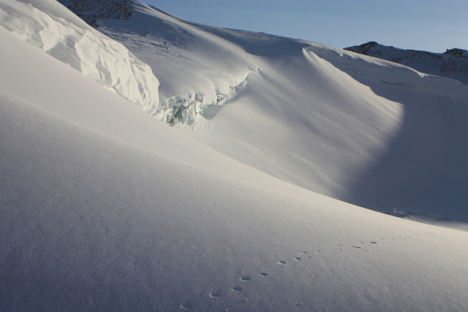 There are areas of open water, though only for a few hours, because the surface temperatures below are well below freezing (approximately minus 20 degrees Celsius). You can see varying stages of sea ice formation, where there used to be open water, and the re-freezing process has already begun. It was rewarding to talk trough the different ice types with Midshipman Brugler, who took the Polar Science course last year, and get visual confirmation on concepts we discussed in the classroom. After approximately 2 hours of data collection at 1,500 feet, we turned the P-3 around and climbed to 17,000 feet. 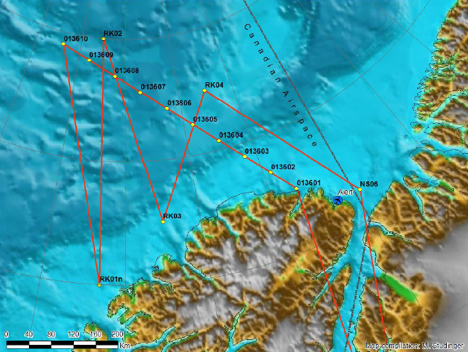 We collected data on the exact same track as our outbound leg, testing the instruments between low-level and high-level collection. The sea ice took on a much different perspective at this higher altitude. We could see individual features before such as actual blocks of ice piled up on each other at a ridge, but now we saw a much larger area, with decreased details. 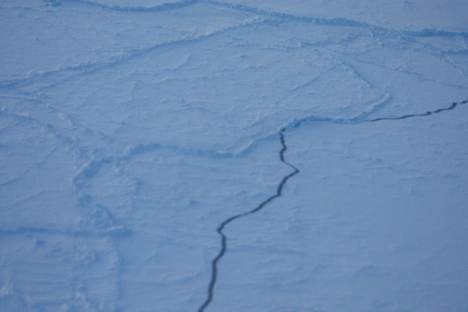 The ice still does not look flat, but more like a jagged jigsaw puzzle, with intermittent breaks in the ice. Both legs were equally exciting and I am looking forward to being back in the air again tomorrow … weather permitting!